A post published on Google’s mobile ads blog recently reported that AdMob a leading mobile advertising network has benefited heavily from the Google acquisition in May of 2010. Stating that “Mobile usage continues to explode”, the greatest gain was measured in Asia where there was an increase of 564% over the past 12 months mainly because AdMob wasn’t very heavily involved in the region, then came Western Europe at 471% and Oceania 363%. According to the post the AdMob network now receives more than 2 billion ad requests per day, quadrupling over the last twelve months and is now servicing more than 100 million unique Android and iOS devices each month, nearly doubling over the last six months. 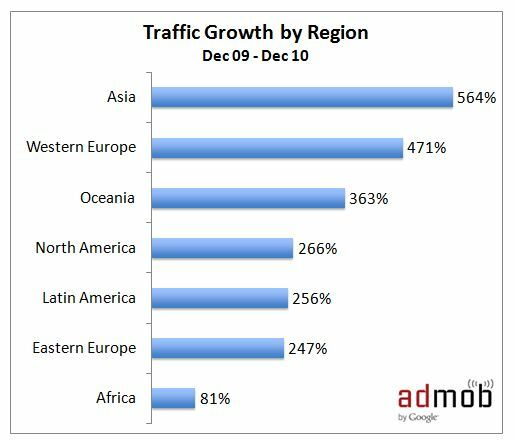 Although Asia had the highest growth, however the post mentions that the growth was global, where there were nine countries that had generated more than a billion monthly ad requests in December 2010 alone, up from just one country the year before. All the more reason to start including more mobile communication and advertising into your marketing mix.